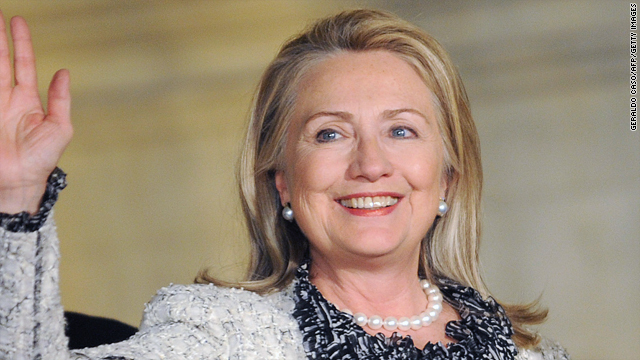 The Hillary Clinton for president buzz is loud - and getting louder. Billionaire investor Warren Buffett tells CNN that there's nobody better qualified than Clinton to become president in 2016. "I like what she believes in. I think she's extraordinarily able and energetic... in pushing those beliefs,” he says. And Buffett is just the latest to talk about a potential Clinton run in four years. He joins President Bill Clinton, House Minority Leader Nancy Pelosi, former Pennsylvania Gov. Ed Rendell and New York Sen. Kirsten Gillibrand. Even Republicans, including former House Speaker Newt Gingrich and Karl Rove, have alluded to it. Google "Hillary Clinton 2016" and you get more than five million hits. For her part, Clinton insists the answer is "no." She is finishing up her term as secretary of state and will leave as one of the most popular members of the Obama administration. Clinton talks about how she's been in the political spotlight for 20 years and wants to have her own time back. Fair enough. She says wants to sleep and relax. OK, but what about after that? While Hillary Clinton has repeatedly said she won't run again for president, this is the same woman who's said that politics is in her DNA. She is a Clinton after all. And with a resume that includes secretary of state, senator, and first lady, the Democratic nomination is likely hers for the taking if she wants it. Vice President Joe Biden has kept the door open to a 2016 presidential run, although he recently acknowledged it might depend on the economy. It might also depend on Hillary. Here’s my question to you: Is Hillary Clinton the answer? What will it take for this country to elect a woman president? Michele Bachmann's dreams of being president are history. And so too is the possibility of the U.S. electing its first woman president - at least for another four years. This was the second election in a row where a woman tried and failed to become president. Hillary Clinton made a great run at it in 2008, but in the end lost the Democratic Party's nomination to Barack Obama. When Clinton bowed out, she acknowledged she wasn't able to "shatter that highest, hardest glass ceiling" but noted that her supporters put about 18 million cracks in it. At the time, polls suggested Americans were more ready for a black president than a woman president. 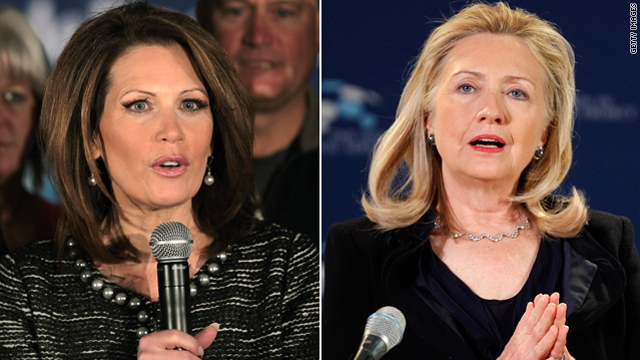 Fast forward four years, and there were high expectations for Bachmann, at least in her birth state of Iowa. Bachmann entered the race as a tea party favorite and became the first woman to win the Ames Straw Poll in August. Unfortunately for Bachmann, that was the high point of her campaign. Here’s my question to you: What will it take for this country to elect a woman president? 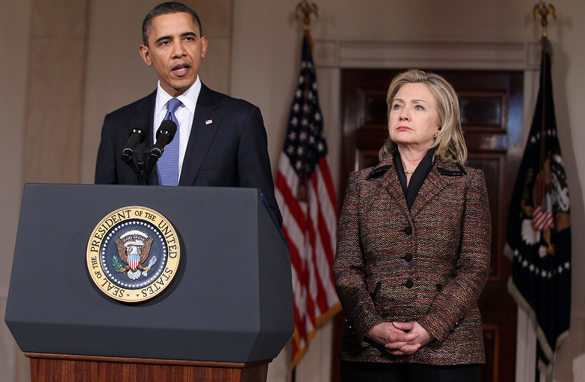 Stronger voice on Libya: Hillary Clinton or Barack Obama? The United States is in a very tough spot when it comes to Libya, and President Obama has taken some heat for not being more vocal on the crisis. The White House has said repeatedly it's weighing its options, and that nothing is off the table. But the president has said little more. And we've been "weighing" for a while now. The president is walking a tightrope: If the U.S. acts unilaterally - no matter how noble the cause of helping those in Libya fighting for their freedom - we will be seen as interfering in yet another Muslim nation's business. That perception is what got us 9/11. So, President Obama isn't saying much publicly. He's had strong words for Gadhafi, demanding he step down; but he's stopped short of calling for any other specifics. Gadhafi's still there. In the meantime, Secretary of State Hillary Clinton has emerged as the mouthpiece for the administration. She traveled to Geneva last week to meet with top diplomats and discuss military and humanitarian options. 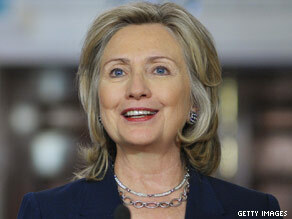 Clinton told Sky News yesterday that the U.S. wants to see the international community support a no-fly zone. She also said it was important that the United Nations decide what to do about the conflict in Libya, not the United States. Some of the president's top aides were scheduled to meet today to discuss the situation in Libya, including Secretary of State Clinton, Leon Panetta, the director of the CIA and Chairman of the Joint Chiefs of Staff, Admiral Mike Mullen. But the President of the United States, the Commander in Chief, was not scheduled to attend. Here’s my question to you: When it comes to Libya, who has the stronger voice: Hillary Clinton or Barack Obama? 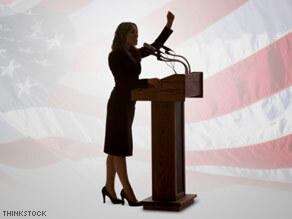 Women politicians more effective than men? Turns out you can add politics to the list of things that women do better than men. It's a long list. The Daily Beast reports on a new study that shows female politicians are among the most productive and persuasive ones in the country. This research in the American Journal of Political Science is the first to compare the performance of male and female politicians. It shows women do a better job at securing pork for their home districts and shaping policy. From 1984 to 2004, women politicians won about $50 million more a year for their districts than men did. As for policy, women sponsored more bills and attracted more co-sponsors than their male counterparts. The female politicians' bills also made it further through the legislative process and got more media attention. The authors say this is because women do a better job at "logrolling, agenda-setting, coalition building and other deal-making activities." They suggest women make better politicians because they have to. Consider that women hold less than one in five of all national seats, so the ones who make it to Washington better be pretty good. The study concludes that in order to overcome any bias against women in leadership roles, these female politicians have to work even harder to be seen as equals. They call their study "The Jackie (and Jill) Robinson Effect," a reference to the first African-American player in Major League Baseball. He was also one of the greatest of all time. The comparison here is that because of racism during Robinson's era, black baseball players had to be better than whites to make it to the big leagues. Here’s my question to you: Why are women politicians more effective than men? Hillary Clinton vs. Pres. Obama in 2012? The first match was good… the rematch could be even better. Imagine that Secretary of State Hillary Clinton decides to challenge President Obama for the Democratic nomination in 2012. Gallup is out with an interesting poll looking at that very hypothetical match up. 37 percent of Democrats say they would back Clinton - while 52 percent say they would support President Obama. The poll shows President Obama does better with college graduates and liberals, while Clinton has a strong showing among less well-educated Democrats. She also scores higher than the president among conservatives and does slightly better among women than men. History shows presidents with relatively low job approval ratings headed into re-election are more vulnerable to challenges from within their own party. It's what happened when Ronald Reagan challenged Gerald Ford - and when Ted Kennedy and Jerry Brown challenged Jimmy Carter. Right now, President Obama's approval rating is in the mid-40s, but there's still two years to go before the election. And two years in politics is a long time. Depending on the economy and the president's policies... it's possible his approval rating could sink further. As for Clinton, it's not likely she would challenge the president. She's on the record saying she's "absolutely not interested" in running again for president... although she has suggested that she doesn't envision serving as Secretary of State in a second Obama term. Here’s my question to you: If Hillary Clinton challenges Pres. Obama for the Democratic nomination in 2012, whom would you support? Should Pres. Obama drop Biden for Clinton in 2012? 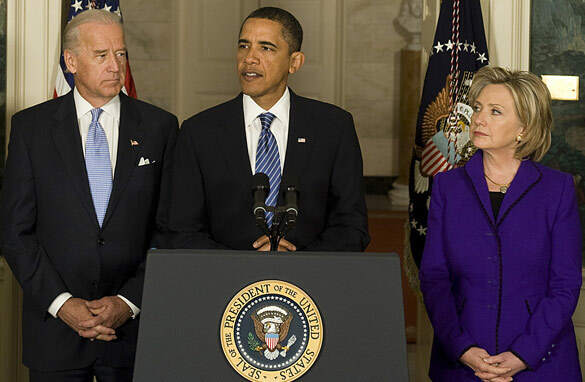 President Obama should drop Joe Biden and put Hillary Clinton on the ticket with him if he runs for re-election in 2012. It's an idea that's getting lots of attention these days... despite the fact that the election is still more than two years away. This all heated up after a piece on Politico.com this month by former Virginia Governor Douglas Wilder. He says as Secretary of State, Clinton has been nothing but a team player. Wilder says she's been tough and commanding when necessary... as well as graceful and diplomatic. He then compares her to Biden, who as Vice President has continued to make his infamous gaffes. Wilder also points out that Clinton might be able to help the President win key voting blocs, like middle class Independents and working class voters. Since the Wilder piece, the idea is popping up all over, from the pages of the Wall Street Journal to Time magazine, AOL's Politics Daily and The Daily Beast. Some suggest Clinton and Biden should swap roles as Secretary of State and Vice President... while others argue that putting Clinton on the ticket will give Pres. Obama the best shot at re-election. And then there's the whole notion of President Obama creating yet another historic ticket - with the first female vice president. As for The White House - it quickly shot down this idea, insisting Joe Biden will continue to be a "trusted partner" for the president. Of course, this could be a moot point if Mrs. Clinton decides to make another run at the top job. Here’s my question to you: Should President Obama drop Joe Biden for Hillary Clinton as his running mate in 2012? How should the Obama Administration approach Mideast peace? President Obama proclaimed that the U.S. will actively and aggressively seek lasting peace between Israel and the Palestinians. 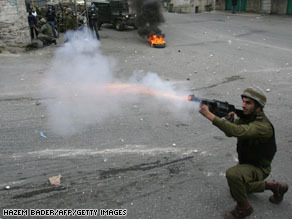 An Israeli soldier fires tear gas at Palestinian stone-throwers during a demonstration by Hamas supporters to celebrate what they called the 'Gaza war victory' following the weekly Friday prayers in the West Bank city of Hebron on January 23, 2009. Last month Israel launched an attack on Gaza that lasted three weeks destroying buildings and claiming lives. A unilateral cease fire was reached last week, and President Obama has urged Israel to open its borders with Gaza. The new President also announced that George Mitchell will serve as special envoy for Middle East peace under Secretary of State Hillary Clinton. Mitchell's credentials include negotiating the cease fire in Northern Ireland in 1998. This is yet another break from the Bush administration that avoided appointing someone to the post. Now former Secretary of State Condoleezza Rice negotiated a deal for open border crossings to Gaza back in 2005 but Israel often shut them down because of security concerns. Israeli officials say they will not open the border if it, in any way, strengthens or legitimizes Hamas. Here’s my question to you: How should the Obama administration approach achieving peace in the Middle East?